(E’zaz) – A Syrian government fighter jet bombed a residential neighborhood, killing more than 40 civilians and wounding at least 100 others in the town of E’zaz, including many women and children, Human Rights Watch said today after visiting the town. In Wednesday’s attack at least two bombs destroyed an entire block of houses in the al-Hara al-Kablie neighborhood of E’zaz, in Syria’s northern Aleppo province. E’zaz residents told Human Rights Watch that, at around 3 p.m., they saw a fighter jet drop at least two bombs on the residential area. Within seconds, dozens of houses in an area of approximately 70-by-70 meters – more than half a football field – were flattened. Houses on the surrounding streets were significantly damaged, with collapsed walls and ceilings. On the streets around the bombed area, windows were broken and some walls had collapsed. Two opposition Free Syrian Army facilities in the vicinity of the attack might have been targets of the Syrian aircraft, Human Rights Watch said. One was the headquarters of the local Free Syrian Army brigade, in the former building of the Baath Party, two streets away from the block that was hit. The other was a detention facility where the Free Syrian Army held “security detainees” – government military personnel and members of pro-government shabbeeha militia. Neither of these facilities was damaged in the attack. Rescuers used two bulldozers to retrieve the dead and wounded from the ruins. By 7 p.m., medical personnel at the scene said they had recovered 25 bodies, and were looking for more in the rubble. A man helping to bury the bodies said that by midnight 33 people had been buried in E’zaz. The exact number of victims is difficult to verify. Most of the wounded were transported to hospitals across the nearby Turkish border. A hospital volunteer in the Turkish town of Kilis, about 20 kilometers north of E’zaz, told Human Rights Watch 61 wounded people from E’zaz had been brought to the hospital, and another 13 people had died either on the way to Kilis or shortly after arrival, among them seven men, two women and four children. At least another 16 severely wounded people were brought to a hospital in the Turkish town of Gaziantep, about 80 kilometers from E’zaz, a doctor in that hospital told Human Rights Watch. I was about 100 meters away from the house when I saw the airplane and heard the sound of the bombing and destruction. My three brothers lived here. I buried 12 of my family members today, including my father, my mother, and my sister – my brother’s wife as well. Walid, my brother, was cut into pieces. We didn’t recognize him at first. We buried my brothers’ children also. The youngest was 40 days old. I was on the roof, making tomato soup, when I suddenly heard the plane. I heard several loud bangs, and was thrown to the floor. When I got up, I saw my wife who was injured – hit in the chest by shrapnel or debris. She was taken to the hospital – I still do not know what happened to her. My brother, sister and my father’s wife were killed today. What was Bashar al-Assad looking for in this area? …There were no weapons here. I live far away from my family, but when I heard the sounds of the explosion I came here and saw all this destruction. 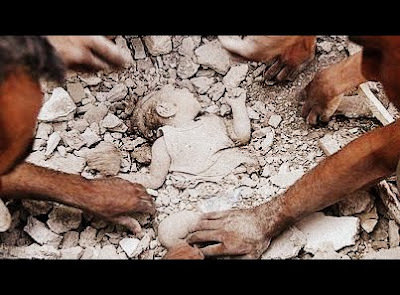 I was here when they removed the bodies of my family from under the rubble. Two of my killed relatives were 9 and 6 years old. …Human Rights Watch called on United Nations Security Council members to impose an arms embargo on the Syrian government and targeted sanctions on government officials responsible for abuses, and refer the Syrian conflict to the International Criminal Court.